D-Day at Stokes Bay Gosport on the Western side of Portsmouth Harbour, played a very major role in the lead-up to D-Day. Stokes Bay was one of the principal sites for the development, testing and building of the component parts of the Mulberry Harbours. The Royal Navy Armament Depot at Priddy's Hard worked at full stretch for over 2 years to build up stocks of ammunition, rockets and mines. The Royal Clarence Victualling Hard supplied enormous daily supplies of food for the D-Day fleet whilst the fleet was assembling prior to D-Day. In Haslar Creek, HMS Hornet was the headquarters for the Motor Torpedo Boat Flotillas and some of the air cover for the invasion fleet was provided by the RN Air Station HMS Daedalus at Lee-on-the-Solent. Gosport provided six embarkation hards for the troops who left for D-Day. Four of these were at Stokes Bay, one at Hardway and one at Beach Street, near the Gosport Ferry Pontoon. At certain tides remains of the concrete platforms can be seen today. Lee-on-Solent played an important role in the invasion of Normandy (Operation Overlord). By 1944, the whole area was bristling with activity and equipment as it provided a major embarkation centre for D-Day. Stokes Bay, Lee-on-the-Solent, Hardway and Gosport Town were centres used in this massive operation. Allied aircraft from the RAF, USAAF, USN, RAAF, RCN, SAAF and Fleet Air Arm descended on Lee in the build up to invasion. The airfield was invaluable as an advanced base during the actual operations, and an important stepping stone for the airlift of equipment and men. Several Fleet Air Arm Swordfish and Avenger squadrons were attached to RAF Coastal Command during mid 1944 to operate both by day and by night over the English Channel in support of the invasion forces. On D-Day itself, 6 June 1944, 435 sorties were flown, a record for a single airfield on that day. In all, over 2,000 sorties were flown, the majority in the first ten days of operation. The PDSA Dickin Medal is Britain's highest animal award for bravery and is better known as the "Animal's Victoria Cross." Forty-three animals -- including 31 pigeons, 18 dogs, three horses and one cat -- have received the Dickin Medal so far. The latest is a Canadian Newfoundland known as "Gander," whom Jeremy Swanson of the Canadian War Museum said saved the lives of Canadian troops during the battle for Hong Kong in 1941, when Japanese forces invaded the British colony. Gander is the first Canadian dog to ever receive the award. The dog was the mascot of the Royal Rifles of Canada, one of two Canadian regiments deployed in Hong Kong. Several times, he distracted Japanese invaders - preventing them from finding hidden Canadian soldiers. His final act was to run after and catch a hand grenade tossed by Japanese troops. Gander carried the grenade off in his mouth. It exploded moments later, killing the dog. Gander was posthumously honoured in Ottawa. Swanson said the "very large black dog" was often mistaken for a bear. "Pilots often spotted him when coming in to land. They would turn away, telling the people on the ground to 'Get the bear off the runway,'" he said. 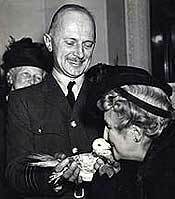 Gustav the pigeon was awarded the PDSA Dickin Medal on September 1 1944 for delivering the first message from a ship off the Normandy beaches.